Home > Communications, Technology, Media > Other Communications A - L > ChanneLinx.com, Inc. 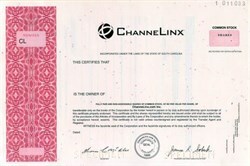 Beautifully engraved specimen certificate from the ChanneLinx.com, Inc. . This historic document has an ornate border around it with a vignette of the company's logo. This item has the printed signatures of the Company’s President/CEO (Jim Sobeck)and Secretary. ChanneLinx specializes in intelligent Internet-based software that connects suppliers and customers to streamline business processes. ChanneLinx's suite of products and services allows companies to create private procurement marketplaces, sell products over the web (via independent websites or through existing e-markets), and develop online exchanges for buying groups, associations, and other organizations. Numerous Fortune 500 companies in the oil and gas, retail distribution, electronics manufacturing, telecommunications, and construction industries use ChanneLinx technology. ChanneLinx is headquartered in Greenville, SC, with an additional office in Houston, TX.